The brightest objects in the universe are called quasars, and now astronomers have found the first miniature version of a quasar beyond the Milky Way. Quasars are supermassive black holes up to billions of times the mass of the sun that release extraordinarily large amounts of light as they rip apart stars and gobble matter. The newfound "microquasar" is a similar object, just smaller. Analyzing how this luminous monster is ripping apart a star could help shed light on the mysteries surrounding black holes, scientists said. Until now, the four known microquasars were all located within our Milky Way galaxy. "Obscuration within our galaxy makes it difficult to study the disks of these microquasars," said study lead author Matthew Middleton, an astrophysicist at the Astronomical Institute Anton Pannekoek in Amsterdam. Now, an international team of scientists has discovered the first microquasar outside the Milky Way, 2.5 million light-years from Earth in the Andromeda Galaxy. "Finding one in a neighboring galaxy means we probably can find many more, thus helping our efforts to better understand their physics," Middleton explained. The microquasar, called XMMU J004243.6+412519, was discovered by the orbiting X-ray observatory XMM-Newton on Jan. 15. NASA's Swift and Chandra satellites then observed it regularly for more than eight weeks. New Mexico's Very Large Array and Very Long Baseline Array, and the Arcminute Microkelvin Imager Large Array in the United Kingdom, also studied the object at radio wavelengths. XMMU J004243.6+412519 is an ultraluminous X-ray source, which can outshine an entire galaxy in X-rays. At its brightest, the amount of X-rays that XMMU J004243.6+412519 radiated was about a million greater than all the light the sun puts out, Middleton told SPACE.com. Astronomers have spent years debating whether ultraluminous X-ray sources are microquasars or just more massive black holes eating more slowly. The researchers saw extremely bright radio-wave emissions from this ultraluminous X-ray source that helped solve the mystery of its identity. Specifically, the investigators saw that radio emissions from XMMU J004243.6+412519 dropped by half in just 30 minutes. "This tells us that the region producing radio waves is extremely small in size, no farther across than the distance between Jupiter and the sun," said study author James Miller-Jones at the Curtin University node of the International Center for Radio Astronomy Research in Perth, Australia. This is "a dead giveaway" that ultraluminous X-ray sources "are just normal, everyday black holes," Miller-Jones said. "Our observations tell us that this ultraluminous X-ray source — and by extension, many others — is just a run-of-the-mill black hole, only about 10 times the mass of the sun, that is swallowing material as fast as it can," Middleton said. The scientists estimate that its companion is a middle-sized, rather than a giant, star. The microquasar brightened and faded over the course of six months as it gorged on its companion star. "We watched a black hole go from nibbling daintily at an appetizer to binging on the main course, and then gradually slowing down over dessert," Middleton said. At its peak, the researchers estimate the microquasar devoured matter at a rate of about 10 trillion tons — about 25 times the mass of all the people on Earth — per second. This rate is close to a theoretical maximum known as the Eddington limit. 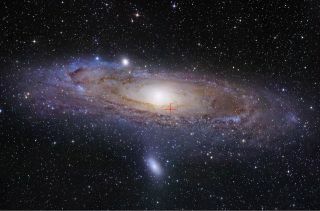 Although the Andromeda microquasar is about 100 times farther away from Earth than Milky Way microquasars are, the absence of dust and gas in that direction allows researchers an unhindered view of the Andromeda microquasar. This could give scientists key new insights on the mysteries of how black holes work, such as how they behave near the Eddington limit. "Understanding how these things work is important, because we think quasars played a big role in redistributing matter and energy when the universe was very young," Middleton said. "The next logical step is to search nearby galaxies for more of these sources," Middleton added. The scientists detailed their findings online today (Dec. 12) in the journal Nature.